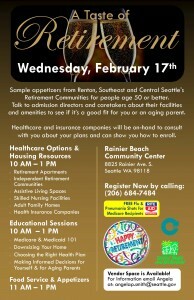 Sample appetizers from Renton, Southeast and Central Seattle’s Retirement Communities for people age 50 or better. Talk to admission directors and caretakers about their facilities and amenities to see if it’s a good fit for you or an aging parent. Healthcare and insurance companies will be on-hand to consult with you about your plans and can show you how to enroll. ← 2016 Internship and Volunteer Fair!